Geodatabase, a spatial database for storing, querying, and operating geographic information, can store vector data and raster data. Vector data is the same as Geo file and Shapefile, which can store the point, polyline, polygon geometry and the attribute data. Some Geodatabases can store raster data as well. In Geodatabase, the file type of spatial data is the same as other data so that users would benefit from the advantages of database while working with the spatial data. Generally, large databases all belong to Relational Database Management System (RDBMS), which provides users with SQL syntax to do the complicated spatial query and to recognize the needed spatial data. Also, it supports multi-users to simultaneously browse, query, and edit the information to improve the work efficiency. In addition, in spite of increasing file size of spatial data and more operation limitations, the database will not be influenced by file size limitation. The version of spatial data is not easy to manage in a traditional file format. In the traditional way, multiple users operate the data at the same time, especially edit the data, and the data might be overwritten, lost, or not easy to manage, etc. despite there is a complete preparation before operating. If the important data is saved in Geodatabase, the data security can be ensured with the mechanism of database as a result. Since the formats of traditional GIS files are various, it is not easy to find appropriate applications to read the GIS files. But now more and more GIS applications support to read and operate the data saved in Geodatabase. If all of the data are stored in highly interoperable Geodatabase, the spatial data can be applied across different GIS applications consequently. Meanwhile, the usability of geographic data and applications can be improved as well. Geodatabase is categorized into personal geodatabase and multiuser geodatabase. Personal geodatabase is for single user to operate on a standalone environment. Multiuser geodatabase supports multi-users to browse, query, and edit the data simultaneously. In SuperGIS series software, the supported personal geodatabase is Microsoft Access mdb format. The supported multiuser geodatabases include Oracle and Microsoft SQL Server. In the aspect of multiuser geodatabase, the most important purpose is to allow multi-users to online edit the data. Users can apply SuperGIS Server 3, SuperGIS Desktop 3, SuperPad 3, and browsers to achieve the target. SuperGIS Server 3 not only provides a series of GIS services but also publishes sources in geodatabases as the editable map services. If the GIS related staff work in the office, SuperGIS Desktop 3 can be used to download and edit the data; if the GIS related staff is doing field survey, SuperPad 3 can be used to edit the features online through the Internet. The GIS related staff can also do the offline editing and then synchronize the data in the office later. After the editing or the downloading is finished, SuperGIS Server 3 will integrate the front-end editing and automatically avoid the possible data conflict (Generally, to separate the editing area can effectively reduce the data conflict. ), and save the editing to ensure the data in Geodatabase is completely correct. 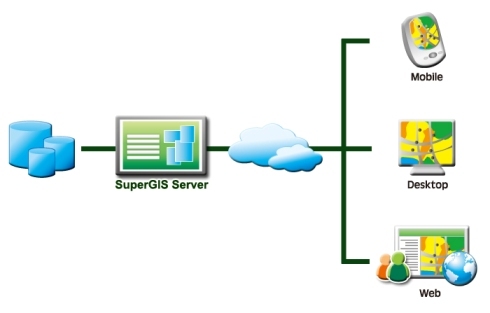 Therefore, SuperGIS Server 3 is definitely the best GIS server software to help you manage and maintain geodatabase.